Become a member of a winning team and benefit from decades of experience with a leading manufacturer of tools and stamping parts. Innovative products and sustainability are united with us in a personal family business. Become part of it. Start a career with us that may last for many years to come – regardless whether you just graduated from school or have many years of professional experience. If you a team player, if you can think out of the box, if you are a newcomer or changing careers, you’re always welcome. If you are engaging and reliable, look no further. We are looking for individuals who would like to tackle challenges with us and would like to develop under our wings. As owner-operated and tradition-conscious family enterprise we offer you attractive job opportunities. You will work in a team comprising young employees as well as experienced engineers and specialists. We offer you a complete spectrum for your in-house career: from development to production, from finances to marketing, from IT to HR, and from engineering to business administration. Find out about us and apply for our current career opportunities. Do you know already what your dream job will be? Vocational training or academic studies? Explore a career with a future. At Kölle GmbH you will be given hands-on experience and you can start a promising future. Our instructors are dedicated and knowledgeable and they will assist you to develop your personal strengths. We joined forces with various educational institutions in order to provide the best possible education for our apprentices – whether at the Vocational School in Bietigheim-Bissingen or at the Cooperative State University in Karlsruhe. 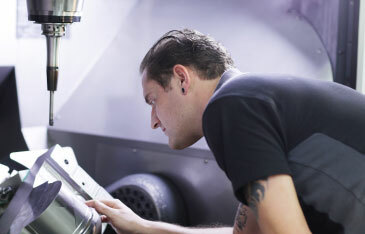 You will be working with state-of-the-art technologies and a variety of metals in a hands-on approach. Your workplace is the tool-and-die making shop floor and the stamping department. You will be interacting with suppliers, customers and in-house departments. You will be working on economic processes and ensure their flawless operation within the corporation. Your workplace is your office. You would like to gain experience or write your Bachelor and Masters thesis? Look no further. Regardless of your academic regulations, we offer you internships or you can work on your student research project in-house. No matter if pre-university work placement, mandatory or voluntary internship, it’s your choice. You choose in which area and for how long you would like to study with us. You may also combine business and pleasure: Gain experience and earn money at the same time. As a student trainee you will work on projects that fir your course of studies, while we ensure that you will progress professionally.